Both accounts assume an annual rate of return of 5%. The rate of return on investments will vary over time, particularly for longer-term investments. Contributions to and withdrawals from both accounts have been increased 2% each year to account for potential 2% inflation. 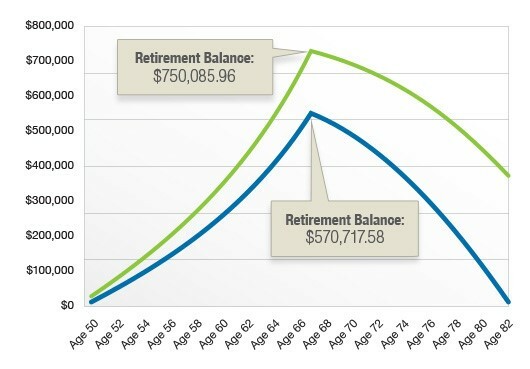 Distributions from 401(k) plans and most other employer-sponsored retirement plans are taxed as ordinary income and, if taken before age 59 1/2, may be subject to a 10% federal income tax penalty. Generally, once you reach age 70 1/2, you must begin taking required minimum distributions. 1 EBRI, 2014 Retirement Confidence Survey 2 Economic Growth and Tax Relief Act of 2001 3 IRS, 2013. Catch-up contributions also are allowed for 403(b) and 457 plans. Distributions from 401(k) plans and most other employer-sponsored retirement plans are taxed as ordinary income and, if taken before age 59 1/2, may be subject to a 10% federal income tax penalty. Generally, once you reach age 70 1/2, you must begin taking required minimum distributions. The content is developed from sources believed to be providing accurate information. The information in this material is not intended as tax or legal advice. It may not be used for the purpose of avoiding any federal tax penalties. Please consult legal or tax professionals for specific information regarding your individual situation. This material was developed and produced by FMG Suite to provide information on a topic that may be of interest. The opinions expressed and material provided are for general information, and should not be considered a solicitation for the purchase or sale of any security. Copyright 2017 FMG Suite.